It’s time to share the love again! Michele Foster aka Mishka is doing it again. This time the swap is Little Buddy Coasters designed by Vicki Ruebel. They are sew cute, how you could possibly resist them? 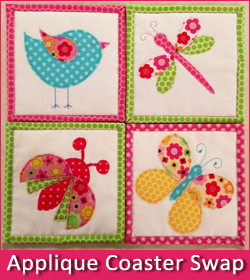 So all you quilters out there, if you fancy cooking up some cutesy little bug coasters, get yourself over to the quilting gallery to register for your pattern and get ready to have some fun! Watch this space for my little critters.